Sawn by us from old orchards being removed in California, these are high grafted stumps with Claro Walnut on the lower part of the board, and English Walnut above the graft. 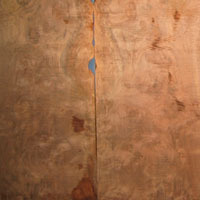 The boards have wild figure with cluster burl, curl, and great reddish brown color. Used for guitars, jewelry boxes, cabinet doors, small table tops, or anything that calls for wide short boards with great figure.